Radon is a gas that is created in the soils where uranium and radium are found. These elements can be found everywhere in the world, therefore any building has the potential for elevated levels of radon. The more uranium found in the soil, the higher the potential for elevated radon levels within a building constructed above this soil. It is not a question of, Is there radon? but rather, How much radon is there? Radon primarily comes from natural deposits of uranium in the soil. It is not because of a man-made landfill or other suspicious sources. Uranium breaks down to radium, which in turn decays into radon gas. 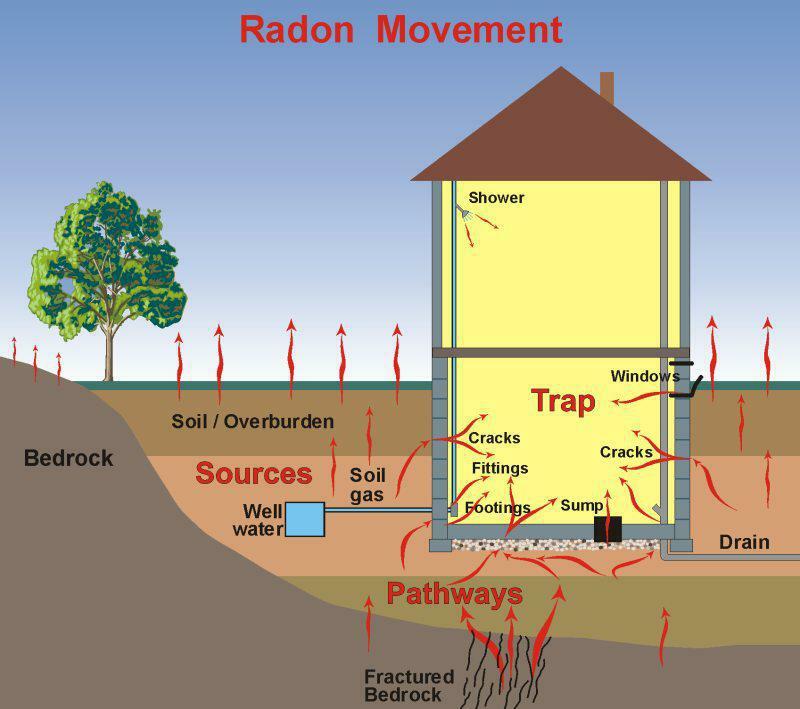 Radon is an inert gas, which means that it does not react or combine with the elements in the ground. Because of this, radon gas can move up through the soil into the atmosphere, where it is easily diluted and presents little concern. However, when it enters a building constructed on top of this soil, it can build up and become a health concern. 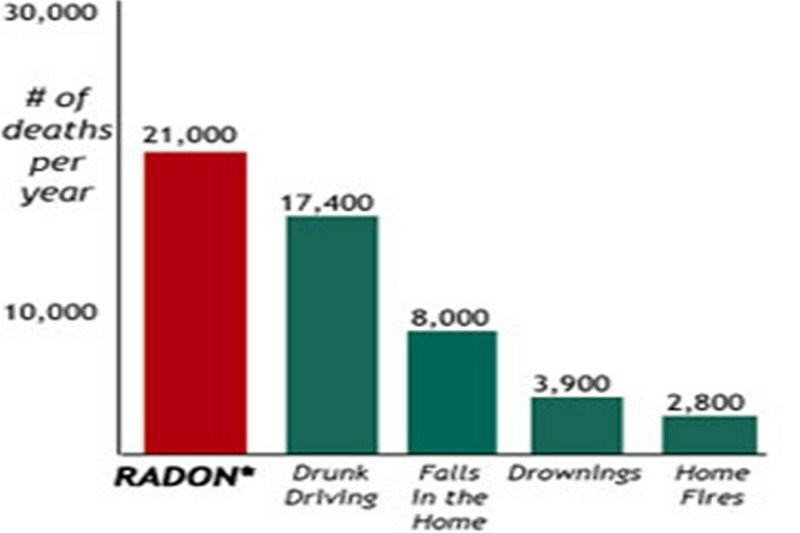 You cannot see or smell radon. There is no way that your body can sense the presence of radon, yet it can have a detrimental effect on the inhabitants by increasing their likelihood of developing lung cancer. When radon decay products are inhaled they will stick to sensitive lung tissue. Being short-lived, they will break down while they are in the lungs, thereby exposing the lung tissue to radiation. When radon decay products decay, they release alpha, beta and gamma radiation. It is actually the alpha radiation (in the form of particles) from the two radon decay products – polonium 218 and polonium 214 – that are the most hazardous. 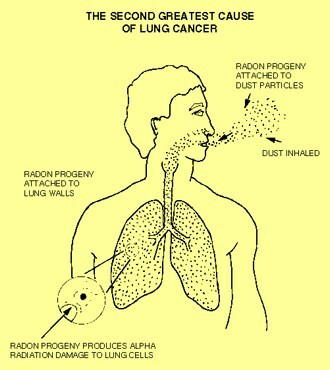 The alpha particles, that come from the decay of radon decay products, will impact the sensitive lung tissue. In most cases they will kill the lung tissue cell, which can be replaced by the body. However, the alpha particles can impact the DNA, or create a chemical reaction that will affect the DNA. When this occurs the cell can become mutated. This is the mechanism by which prolonged exposure to radon and radon decay products can increase the potential of lung cancer.